Cassava Pudding or Poudine Manioc like we call it here in Mauritius, is a well appreciated 'snack' during breakfast time or on its own! Usually you would find hawkers selling them, but nowadays they are becoming as scarce as hen's teeth!! Why, then, not try making yours yourself?! This is my take on the recipe, actually the recipe credit goes to my Sister-In-Law, she is an awesome cook!! Alternatively, you can steam the pudding instead of microwaving! It will take about 15 minutes! Have fun at making this delicious treat!! In a bowl, mix all the ingredients, except for the dessicated coconut. Microwave on high, for 10-15 minutes or until a glutinous mass is obtained. Allow cooling and cut the pudding into squares. Roll the squares in the dessicated coconut and let coat evenly! Delicious pudding Love to try it. 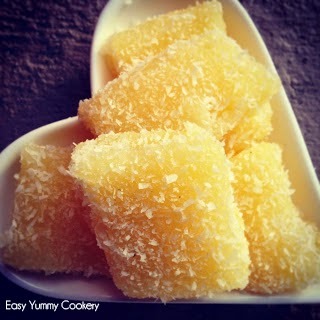 I made your recipe of pudding manioc. Was amazing!